Take two: “Dhanmondi?” CNG driver, “Which road?” “Road Number noy, number nine” GNC driver, “okay.” My mom and I are off again, this time in the right direction. 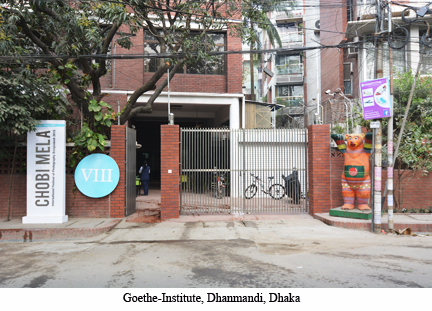 By some miracle the driver took us directly to the doors of the Goethe Institute. 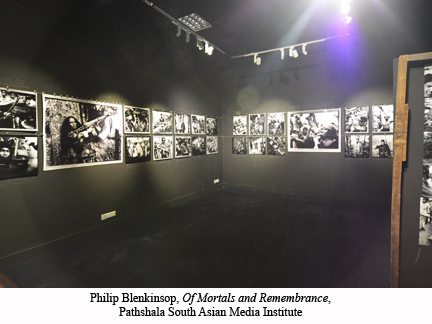 We have officially made it to the Chobi Mela VIII: Bangladesh International Photography Festival, held from January 23 to February 5, 2015. This two week festival included photography exhibitions, lectures, artist talks, portfolio reviews, and workshops. The lectures and artist talks were all held at the Goethe Institute and once we found our way there we never had a problem getting back. The photography exhibitions were held across the city and ranged from war to conceptual to historical to hilariously funny to everything in between. The festival director is Shahidul Alam, who also founded DRIK, a photography agency and is on the advisory board at the Pathshala South Asian Media Institute. Alam was one of a panel of curators which included Munem Wasif, Tanzim Wahab, ASM Rezaur Rahman, Mahbubur Rahman, and Salauddin Ahmed. The festival’s seventeen exhibitions showed work by thirty-one artists at eleven exhibition spaces. Each space had its own feeling depending on whether it was a traditional or non-traditional exhibition space. 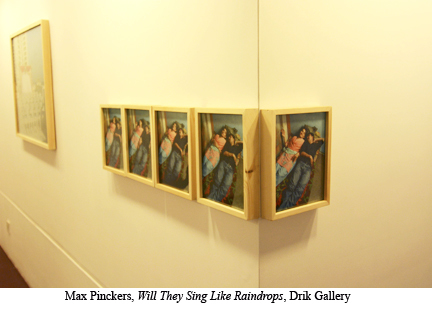 Tiny moments draw the viewer in, like my experience at Anwar Hossain’s exhibition at the Alliance Francaise de Dhaka. I walked into the space and began to look. All of the lights were not turned on but as I walked through one of the volunteers began to plug the lights back in. As I stood looking at one of the photographs this is what I wrote, “Standing in front of an unlit photograph. The light switches on and I can see the details in the wooden wheels. Piles of wooden wheels extend from the left side of the frame creating a triangle. A girl around four or five years old sits on the wheel at the head of the triangle with her back to the camera. She looks over at a man in the top right hand corner; he is on crutches as he has only one leg. His body is cut in half by the frame leaving you to wonder what he looks like. How old he is.” These moments were I am experiencing the object of the photograph and its current surroundings are what I love about the overall Chobi Mela experience. At Northbrook Hall in Old Dhaka you enter a dark theater. As I come through the threshold I realize there is a large photograph hanging across the stage. The photograph is a theatrical scene of red curtains pulled back to reveal a simple chair angled away from the viewer at a three-quarter turn. As I walk closer to the stage my eyes start to adjust and I can see something hanging from the ceiling. Once I reach the stage I turn around and hanging over the seats are nine round photographs 4 to 5 feet across. There is an interesting conversation between the empty chair on the stage and the human subjects of the round photographs. There is something biblical about the photographs as if the empty chair represents God and the people are performing for him. 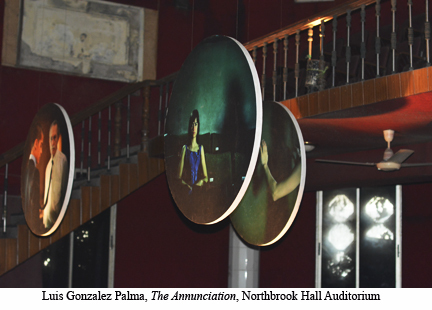 As it turns out the artist Luis Gonzalez Palma is responding to paintings of the annunciation. Through these photographs he is exploring how we see ourselves in the new global world, in which religion plays a large part. The lectures were wide ranging from a discussion of Edward Curtis to Pix an online Photograph Magazine based in India to the topic of surveillance. However, I was especially looking forward to a lecture by a Nayantra Gurung Kakshapti from the Nepal Picture Library. I know basically nothing about photography in Nepal so I was excited to learn. 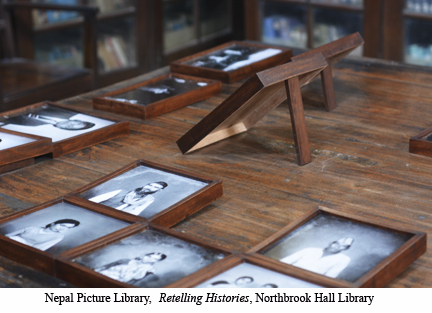 The Nepal Picture Library is a digital archive of historical Nepali’s photography. The four full-time employees and volunteers scan and digitize photographs but they do not retain the hard copies, they are returned to their respective owners. 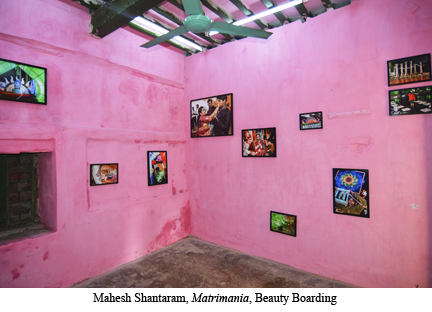 Then Nepal Picture Library is an extension of Photo Circle, an organization that aims to help contemporary Nepalese photography thrive through publication, exhibition, and commissioned work. Kakshapti discussed the work of seven photographers: Surendra Lawoti, Prasiit Sthapit, Kishor Sharma, Shikhar Bhattarai, Arantxa Cedillo, Uma Bista, and Mukunda Bahadur Shrestha. I found the documentary work by Sthapit and the playful female portraits by Cedillo the most fascinating. Sthapit’s photographs document the cultural influence China has had on the Nepalese, while Cedillo’s uses painted backdrops to photograph female Nepalese pioneers. These women include the first Nepali woman to climb Mount Everest, a female rocker, and a female pilot among others. It is also important to note that Shrestha was the first official photographer for the Nepal Tourism Department. The photographs he took in the 1970’s and 1980’s continue to shape the work view of Nepal. Another highlight of the talks was Indian photographer, Mahesh Shantaram. He attended photography school in Paris and when he returned home to India he began photographing weddings. However, he says he hates weddings. He explained that at most Indian weddings there are multiple photographers, so he leaves the traditional posed portraits to the others and he gets all the candid material he can. Indian weddings are an elaborate affair and he captures everything from the napping uncle to the surreal décor. He was a very entertaining speaker and at the end of his talk he scrolled through the Matrimania photographs while he blared Eminem’s song Business, which he refers to as “calm and soothing”. It was hilarious and everyone had a smile on their face. Who says a lecture has to be all buttoned up and serious. However, the most illuminating talk was the curatorial talk. Each of the curators explained which exhibits they worked on and did what they did then it turned into a question and answer session. There were some general questions and then towards the end a young man asked why there was only one photograph in the exhibition dealing with 1971, which is the year Bangladesh got its Independence from Pakistan. Alam explained that the photography festival was not about 1971 or Bangladesh’s history, so it was a non-issue for him. Another young man addressed the panel saying he had just returned from a trip to Europe and wanted to know why European photography and Bangladeshi photography was so different, that European photography was simpler easier to understand. I do not remember the panel’s exact response as my brain was in high gear. I questioned why one would want the photography of their country to resemble that of Europe. That was the whole reason I traveled half way around the globe was to get a new perspective, to see the world in a new way. The histories, cultures, and religious diversity of two regions are different, all of these factors play into the photographs examining different topics and employing different aesthetics. This talk was by far the most eye-opening. In the end, I did not make it to every lecture (Dhaka traffic is some of the worst on the planet), and I missed out on a few exhibition because of some political marches, but I got exactly what I was looking from my visit to Dhaka and the Chobi Mela, a new way of considering photography and a push outside my comfort zone which will always change one’s view of the world and ultimately how I photograph it. You can find a full list of photographers and watch videos of the lectures at www.chobimela.org.